So the knowledge of the mechanical properties of the material is desirable for any mechanical student or for any person belongs to mechanical industries. 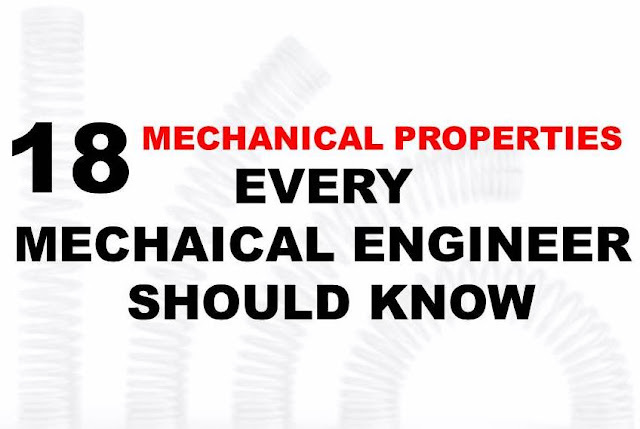 This article brings the top 18 mechanical properties. I hope you will like it. There are mainly two types of materials. First one is metal and the other one is nonmetals. Metals are classified into two types: Ferrous metals and Non-ferrous metals. Ferrous metals mainly consist of iron with a comparatively small addition of other materials. It includes iron and its alloy such as cast iron, steel, HSS etc. Ferrous metals are widely used in mechanical industries for its various advantages. The ability of a material to withstand load without failure is known as strength. If a material can bear more load, it means it has more strength. The strength of any material mainly depends on the type of loading and deformation before fracture. According to loading types, strength can be classified into three types. If a material regains its original dimension after removal of the load, it is known as an elastic material and the property by virtue of which it regains its original shape is known as elasticity. Every material possesses some elasticity. It is measured as the ratio of stress to strain under the elastic limit. The ability of the material to undergo some degree of permanent deformation without failure after removal of the load is known as plasticity. This property is used for shaping material by metal working. It mainly depends on temperature and elastic strength of a material. The ability of a material to resist elastic deformation or deflection during loading, known as stiffness. A material which offers a small change in dimension during loading is stiffer. For example, steel is stiffer than aluminum. The property of a material to resist penetration is known as hardness. It is an ability to resist scratching, abrasion or cutting. It is also defined as an ability to resist fracture under point loading. Toughness is defined as an ability to withstand with plastic or elastic deformation without failure. It is defined as the amount of energy absorbed before an actual fracture. A property by virtue of which a metal can flatten into thin sheets, known as malleability. It is also defined as a property which permits plastic deformation under compression loading. why most of machines body made of cast iron. The slow and progressive change in dimension of a material under influence of its safe working stress for a long time is known as creep. Creep is mainly depended on time and temperature. The maximum amount of stress under which a material withstand during the infinite time is known as creep strength. The amount of energy absorb under elastic limit during loading is called resilience. The maximum amount of the energy absorb under the elastic limit is called proof resilience. The failure of a workpiece under cyclic load or repeated load below its ultimate limit is known as fatigue. The maximum amount of cyclic load in which a workpiece can bear for an infinite number of cycle is called fatigue strength. Fatigue strength also depends on workpiece shape, geometry, surface finish etc. This is all about the mechanical properties of a material. If you have any query regarding this article, ask by commenting. If you like this article, don’t forget to share it with your friends. Subscribe to our website for more interesting articles. Thanks for reading it.